Bhí lá fíor-ghnóthach againn inniu. Idir céilithe, tráth na gceisteanna, seóanna, ealaín agus gléasadh suas bhí gach duine gafa! 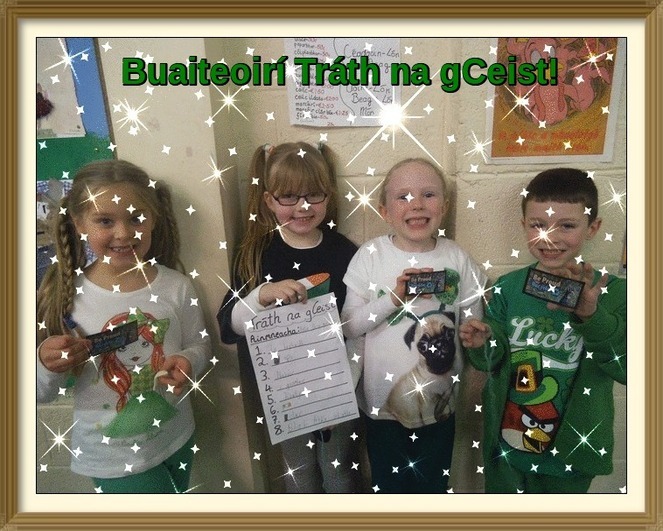 Beidh dioscó glas anocht freisin ar a 6.30 - 8in buíochas le Cumann na dTuistí. We had a very busy day at school today between ceili's, St.Patrick's Day art, table quizzes, assembly performances and of course dressing up in green. There will be a 'Green Disco' also this evening from 6.30-8pm courtesy of the Parents Association.